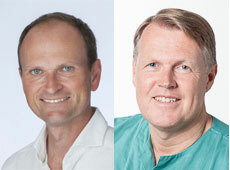 Oslo University Hospital researchers Geir Ringstad and Per Kristian Eide have recently been interviewed by the major national newpaper VG for an article entitled "Norwegian researchers: Sleep may slow down dementia". The story is based on results from paper published in the journal "JCI Insight", entitled "Brain-wide glymphatic enhancement and clearance in humans assessed with MRI", where Ringstad (Dept of Radiology) and Eide (Dept of Radiology and Dept of Neurosurgery) are first and last authors. The study provides in vivo evidence of access to all human brain subregions of a substance administered intrathecally. Clearance of the tracer substance was delayed in the dementia cohort. These observations open new prospects concerning intrathecal treatment regimens, extravascular contrast-enhanced MRI, and assessment of brain clearance function. Ringstad G, Valnes LM, Dale AM, Pripp AH, Vatnehol SS, Emblem KE, Mardal KA, Eide PK.